With the start of the Fall semester, I am beginning to think that my aim to do a blog post a day was a little too ambitious… Nevertheless, despite having missed a few days, I am going to try and get back on the horse! 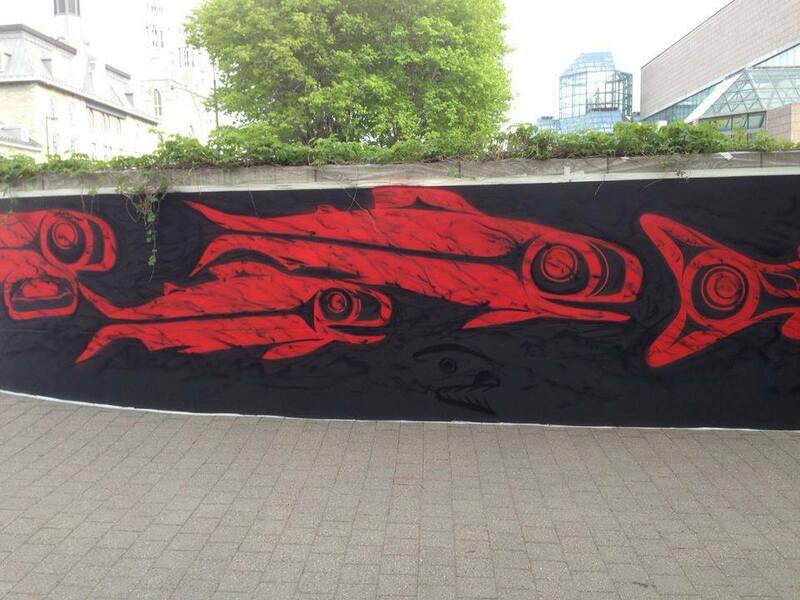 Larissa Healey and Corey Bulpitt with their mural Salmon Cycle – The Spirit Within 2013, National Gallery of Canada, Ottawa, Canada. On my recent visit to Vancouver, I became a little obsessed with Northwest Coast Indigenous art. It really is hard not to: it is extremely visually compelling, and speaks so beautifully to the landscape from which it comes. It certainly didn’t hurt that I spent much of the week at the University of British Columbia’s Museum of Anthropology, which houses so many cultural riches of region’s traditional owners. Lacking the budget to acquire any artworks, I returned with a lot of presents for my young son: a very nice t-shirt designed by Eric Parnell; an animal puzzle designed by Doug LaFortune (which Gabriel loves) and the Book of Play with Northwest Coast Native Art . Corey Bulpitt and Larissa Healey, The Storm, 2011, Grenville Street Bridge, Vancouver, Canada. This evening, as Gabriel and I were reading the Book of Play, one image in particular caught my attention. 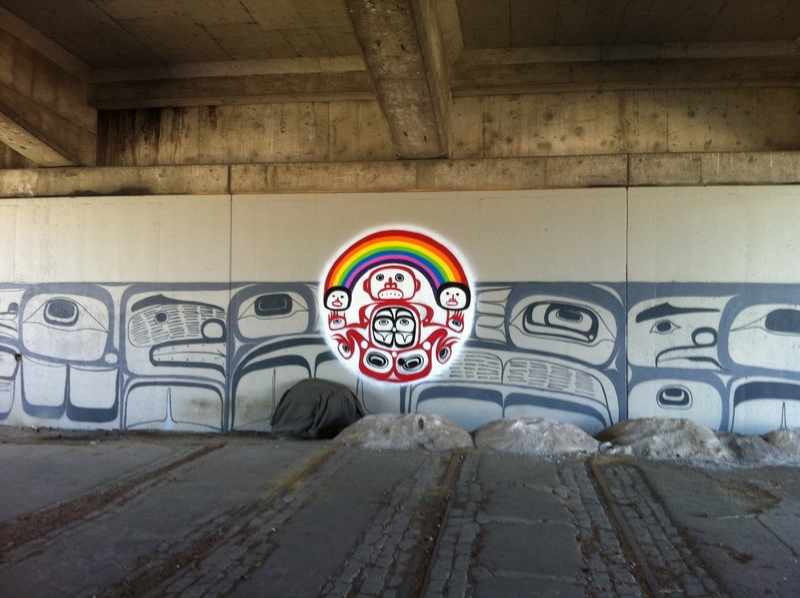 It was the Haida artist Corey Bulpitt‘s depiction of the rainbow. It is a striking image: the contrast between the multi-colour of the rainbow and the thick blocks of black and white typical of northwest coast art causes the image to leap out. Seeing the image in Gabe’s book reminded me of the first time I had seen this motif, in a different work of Bulpitt’s, which I stumbled upon quite by accident while in Vancouver. 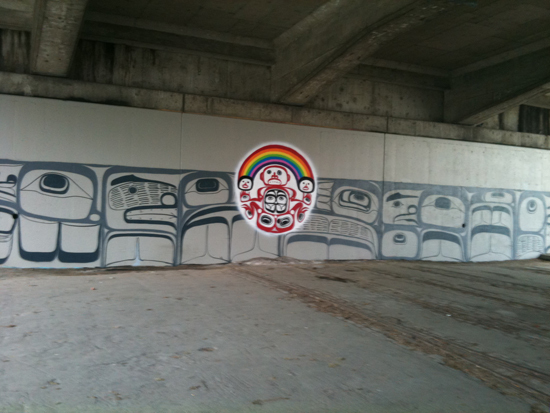 In 2011, Bulpitt included the rainbow motif at the very centre of 50 foot mural entitled The Storm. The Storm is one of two murals underneath the Granville Street bridge in Vancouver; the other being an equally impressive work by Bulpitt’s frequent collaborator Larissa Healey (which I believe pre-dates The Storm by 3 years). I was very pleased to stumble on these works, because I had recently seen Bulpitt and Healey’s wonderful mural outside the National Gallery of Canada, which had been commissioned for the exhibition Sakahàn: International Indigenous Art. 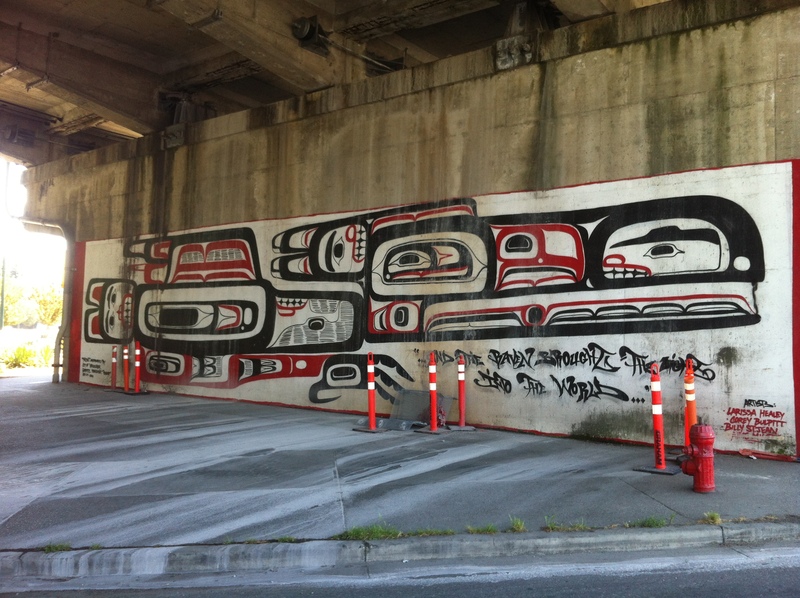 Larissa Healey and Corey Bulpitt, Granville Street Bridge Mural, 2008, Vancouver, Canada (photo 2013 by author). As my photos show, the Grenville Street bridge murals have suffered a bit from the elements. Nevertheless, the rainbow beams out with an irrepressible luminosity. Bulpitt and Healey’s murals clearly belong to two identifiable traditions: Northwest Coast Native art and the more recent graffiti styles. In their dress and invocation of the parlance of hip-hop, they clearly find this to be a compatible marriage; certainly, their artwork moves fluidly within and across both circles of influence very productively. This week, however, I have been thinking about these works in slightly different terms. Corey Bulpitt and Larissa Healey, The Storm, 2011, Grenville Street Bridge, Vancouver, Canada (photo 2013, by author). 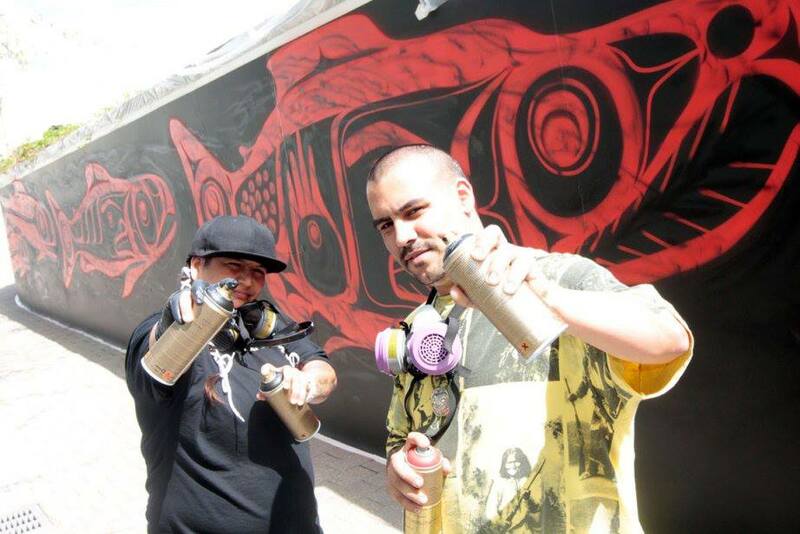 In the 1920s, when Diego Rivera, José Clemente Orozco and David Alfaro Siqueiros revived the Mexican tradition of mural paintings, the attraction of muralism to these artists was, in part, that it was anathema to the formalist traditions of easel painting. Murals were a way of reconnecting modern art to the people; of inserting it into the very architectural fabric of society. To this end, the Mexican muralists revived the Renaissance tradition of fresco painting, in which paint is applied to wet plaster, literally becoming part of the substance of the wall upon which it is painted. In some ways, I see a very obvious parallel here to what Bulpitt and Healey are attempting to do through uniting traditional Haida and Anishinaabe designs with the modes, mediums and language of the street. But there is something more here I think needs to be teased out. As a medium, fresco also attracted the Mexican muralists because of its permanence; it was intended to last forever, just like the revolutionary governments that it celebrated. How does this compare to Bulpitt and Healey’s murals, which belong to the ephemeral tradition of graffiti? Larissa Healey and Corey Bulpitt, Salmon Cycle – The Spirit Within 2013, National Gallery of Canada, Ottawa, Canada.